Various animals and figures are used for particular purposes as they represent certain powers. Soul Strength, Power from Within, Introspection, Healing. 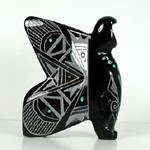 This entry was posted in Fetishes, Symbols & Powers and tagged badger, bear, carving, eagle, fetish, heartline, horse, medicine bundle, mountain lion, navajo, stone, turquoise, wolf, zuni by Native American Jewelry Tips. Bookmark the permalink.